When having your own build or bought house, it's a never ending story. Things are never done or you always want to change things up. For example, our outdoor deck is just a deck. It's in need of a good paint right now, because it's getting to much love from the sun. The decorating and styling part is on hold. I've bought two wooden chairs and that's basically all I did. Can't hide from the fact that furniture can be what expensive here on the island. But looking at the deck, was a good reason to participate in the "Florida room style board challenge". I was contacted by the coordinator of the Douglas Elliman, a global real estate firm, to participate. When a firm like that has seen your blog, that means the blog is going places further than this little island in the Caribbean. So, I went for some digging for what the term "Florida room" meant. It's basically just another word for a sun room. Beside my own idea for the sun room, I got some pretty interesting ideas from Douglas Elliman Florida Real Estate Page. I mean, seriously, living in Florida can be a dream. 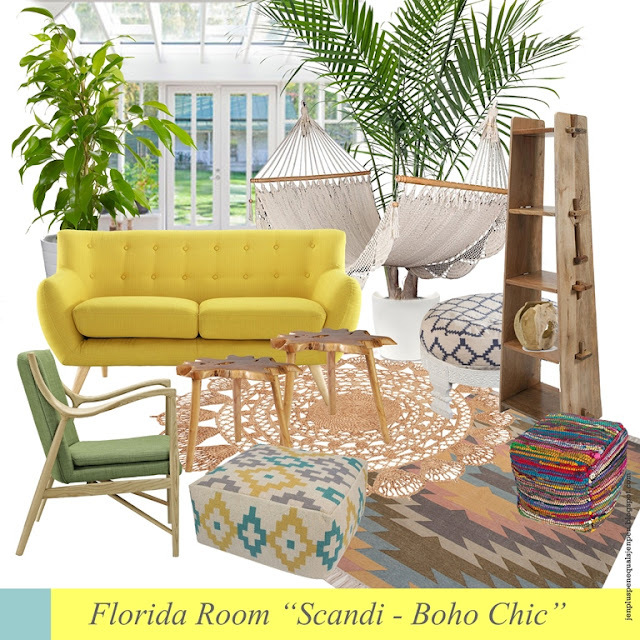 So I made a mood board for a sun room that can be placed in the colder places of the world. My thoughts went directly to all white, with pastel colors like blue, green, orange and yellow. A Scandinavian vibe with pastel colors and a bit of Boho chic. Here on Curacao, we don't really need a sun room. The outside space, like my deck, is the "sun room". Literally outside enjoying the sun and wind. But of course there are places that don't have this tropical weather all year long. I can relate, because I've lived in the Netherlands for most of my teenage years. So I know when the sun says hello and goodbye. And having a sun room would bring you just a little bit closer to the warm weather. Scandinavian look has most of the time white as a base color. So think for your walls and floors an all white color. You can have an wooden floor white washed or painted plain white. You can also work with shades of light grey. To give the room a warm feeling, I'm adding wood furniture pieces to the mix. Layer up the floor with colorful rugs. I made here a combination of an colorful traditional rug and a simple jute rug. Here we'll be adding the bohemian pieces like the hammock and the colorful poofs. When thinking of a bohemian theme, think about adding several greenery. Adding plants to the mix, will give you the tropical feeling instantly. I wanted to add the color yellow and a soft green to the sitting pieces. This will bring you to the warm vibe but also combines well with the weather in the colder places of the world. Below some images to get you more inspired in my theme. The great thing went searching for furniture I came to see great stores online that I've never heard of. The pieces selected in this mood board are all pieces from a store called FROY and the prices are amazing. The jute rug is one piece from the Home collection of H&M. This was one fun challenge to do. My creativity went wild here and I hope you liked the vibe I was going with and that you could get some inspiration from it. Do you have a sun room or a Florida room, as they say? This might be a good challenge for you. Do share your comments with me below. I was asked to participate with this challenge. All opinions and ideas are my own.. I was not paid for this post. 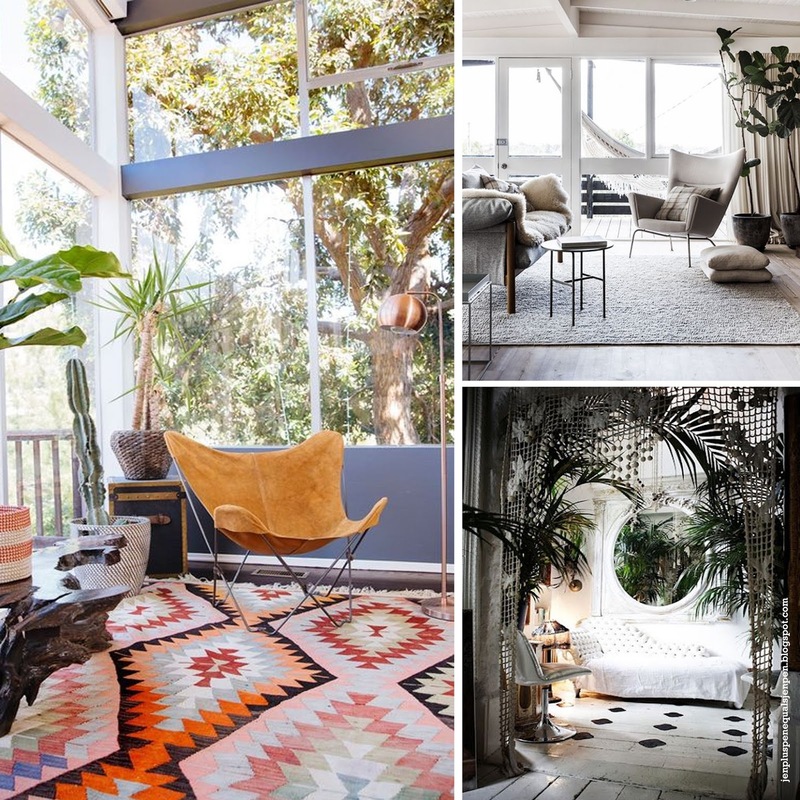 I have been thinking of getting a contractor to add a sun room to my house, your post and images are much needed inspiration. Lovely designs. I really like that bright yellow couch, it would cheer up any room. Yes.I really love yellow. It's a great pop up color.